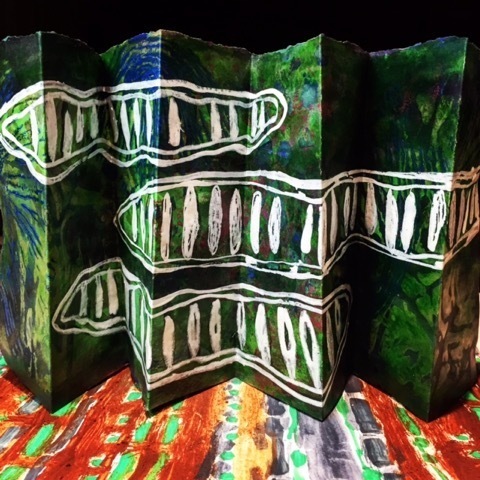 Sophie Munns' newest collection of work includes paintings on linen and her Concertina books, which open and evolve as seeds do. 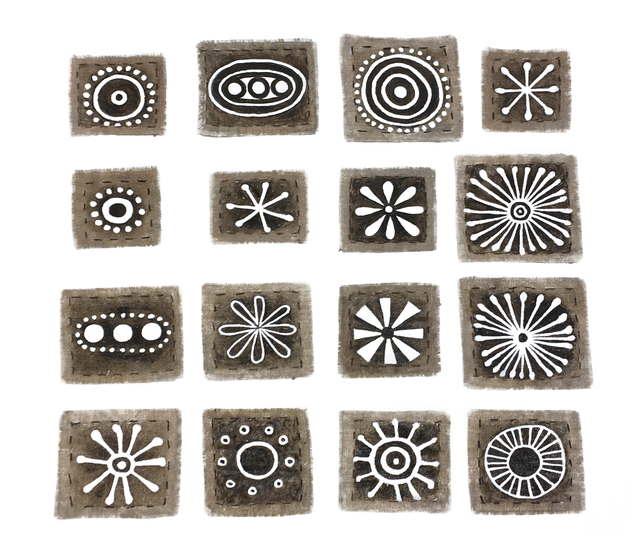 The work bears traditional seed motifs that remind the viewer of humanity's intimate natural inheritance of agriculture. 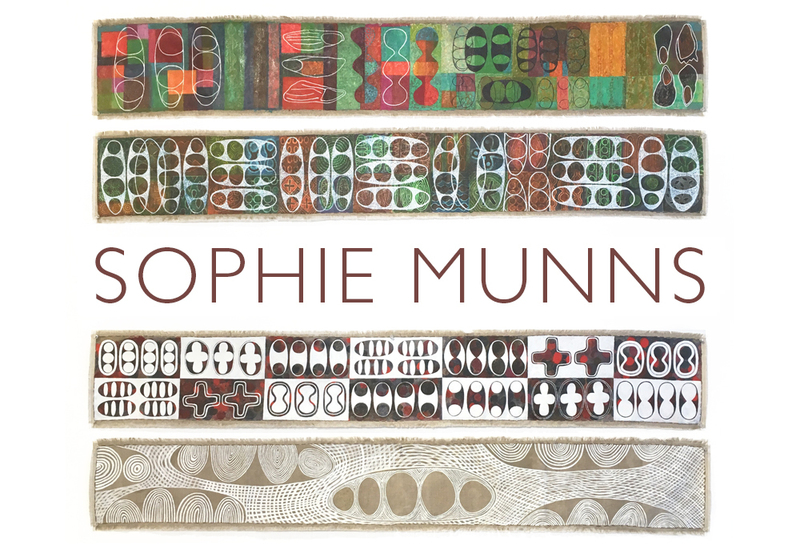 Sophie Munns is a visual artist whose love of natural and living things has stayed with the artist through 5 decades and 36 relocations between city, urban & regional landscapes. Her wish to explore and develop her passion for ancient and diverse cultures, gardens and the shared table has informed her career and life choices as well as her art. In 2013 Sophie continued her Homage to the Seed project, first launched in 2010 during her residency at Brisbane Botanic Gardens and has continued to visit seed banks as often as possible for residencies and workshops. 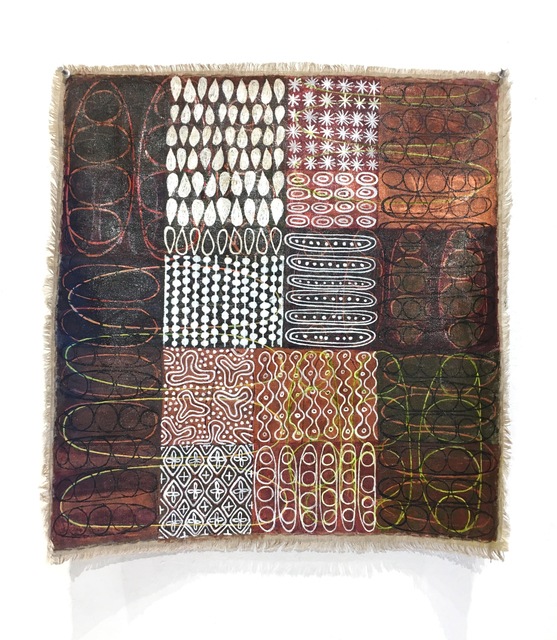 Through these works, Sophie hopes to highlight the age-old relationship between people and plants and to comment on how textile traditions carry profound interactions between humans and nature. During the months of January through March of 2016, I traveled to a Plantbank residency in Sydney, visited the Australian National Seedbank in Canberra, the Australian Grains Genebank in Western Victoria, Seed Victoria Seedbank in rural Victoria, the Seedbank Project in Melbourne Victoria, and PlantBank at the Australian Botanic Gardens in Sydney. I spoke to many scientists and seed workers about the reasons behind their work and when I returned home from this intense four months, I was almost too tired to think or speak, my mind was so saturated. However, I found that I had a burning need to paint to still my mind, like arriving home long after I’d in fact come home. 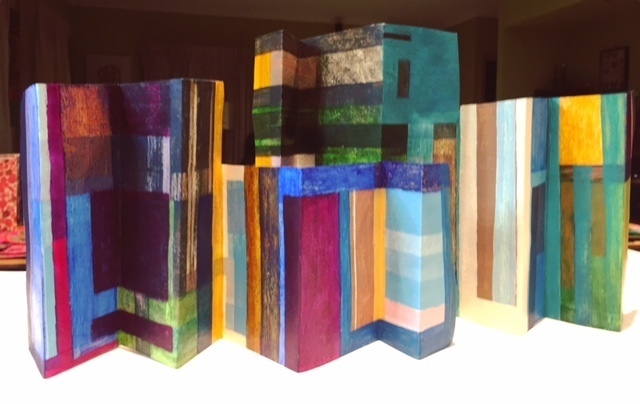 While my mind slowly absorbed the formative ideas I’d found in my rich experiences, the Concertina books grew… not on a large scaled canvas, but in books on paper: some cotton rag paper or watercolour paper, that open and expand and contain so many pages to which I added more pages. 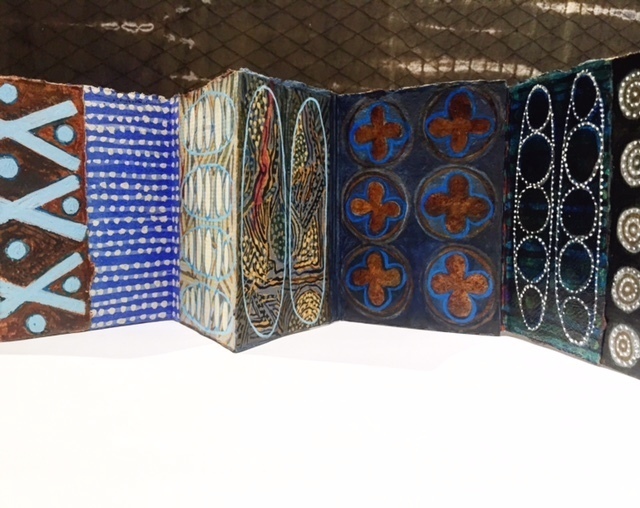 Some Concertina books grew to include extra pages that lift out, that reveal more and more if you keep looking. This to me is what seeds are like. You pick up a simple looking pod or capsule and it opens, sometimes easily, sometimes with force. And then you can cut open the seeds and a seed morphologist can describe all the parts and workings. A molecular scientist can take you down to the DNA that connects you to the phylogenetic tree of life and the understanding that all things are connected from the earliest of times. 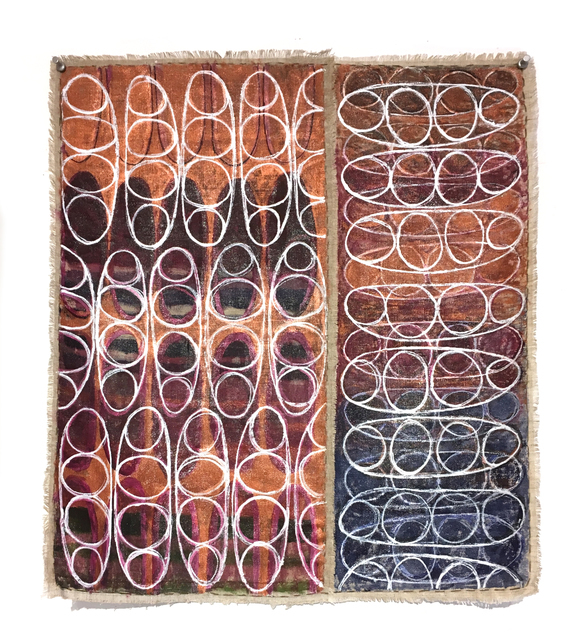 This collection of work weaves in several focuses. One major focus is on the “Crop Wild Relatives” projects undertaken collaboratively by Global Crop Diversity Trust and Millennium Seedbank as well as PlantBank and the Australian Grain Genebank. It’s a fascinating crossroads of scientific activity where seeds in their most original state are sought for their potential in breeding more resilient crops in the time of climate change. Combined with this, I have revisited past research on the symbols from early cultural centres that pertain to plants and seeds. I find that in the face of massive changes it is crucial to look at seeds in terms of past, present, and future. The fact that humanity through time has had an intimate and dependent relationship on seeds, means that we must take far more notice of this natural inheritance. My continuing preference for painting onto unframed, unstretched linen is also a way of paying tribute to textile traditions around the world where cloth was made from natural resources as available in a particular location. Textiles were also used in multiple ways, able to be carried and stored more easily than many of the kinds of artworks that have come into fashion at a later date. The books with their imperfect torn edges and textual qualities feel similar to the linen artworks… vehicles for much more than just paint. The motifs, patterning, colours and textures have a tactile feel to me as a painter. It’s no long an empty space being filled, but a cultural artifact wanting to come to life.